Home » Vietnam Travel » Da Nang City » Shopping In Da Nang – Where To Shop For Tourists? 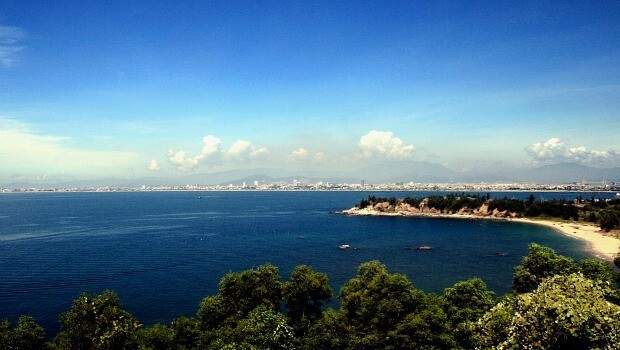 Da Nang (Đà Nẵng) is a fabulous tourism city which marks the halfway point between the capital in the North, Ha Noi (Hà Nội) and Ho Chi Minh (Hồ Chí Minh) city in the South. Considered as the third largest city in Vietnam, apart from some well-known sights and beaches, like Lang Co (Lăng Cô) Beach, Hoi An (Hội An), My Son (Mỹ Sơn), and Non Nuoc (Non Nước) Beach, another main reason for most travelers staying here is its shopping highlights. Shopping in Da Nang is characterized by the Vietnamese local market tradition despite it has fewer offerings of culture and craftsmanship than elsewhere. The range of merchandise available in this city is larger and more typical than other areas of Vietnam, yet souvenirs and handicrafts from far central areas of Vietnam are also available here. Da Nang might not seem like the ideal destination for shopping yet there is, in reality, a handful of places to shop in Da Nang. Hence, if you plan to spend your significant time shopping in Da Nang, it will help you plan ahead of time. What makes your trip more meaningful is that you have some presents for your family members and friends after traveling, doesn’t it? If you are wondering what places good for shopping in Da Nang are, then there is no need to worry because here you will discover some ideal places for shopping in Da Nang. There are a variety of choices for you when it comes to shopping in Da Nang, from budget places to luxurious, high end ones. Once you could pinpoint the best place to shop, you could rapidly go there to get what you need. Check out the following list! Established nearly one decade ago, Han Market has become the most popular and crowded market in Da Nang city. It is located near Han River, so farming products and seafood could be easily accessible to be traded. In the past, Han Market is just for rich people; nevertheless, nowadays, the majority of locals and foreigners also visit Han Market to purchase a variety of products, from traditional clothes to fruits at reasonable prices. Even though in the old days, Han Market was just a modest trading venue for a small number of businessmen, the ideal and convenient location have enabled it to develop into a big trading center near Han River, from which locals give it the name Han Market. Situated in the city’s centre, right at the grand intersection of Bach Dang (Bạch Đằng) Street, Tran Phu (Trần Phú) Street, Hung Vuong (Hùng Vương) Street, and Tran Hung Dao (Trần Hưng Đạo) Street, this market holds an important position in Da Nang history. Recent days, thanks to the renovation, this market has a refreshing and spacious atmosphere and the arrangement of shops and stores inside give customers a relaxing feeling upon shopping there. This building has two giant complexes where people could buy fashion items or foods. Despite Han Market is easily accessible, it is not suitable for those fainthearted or those people who are looking for olfactory pleasure; in fact, it is a bit stinky. 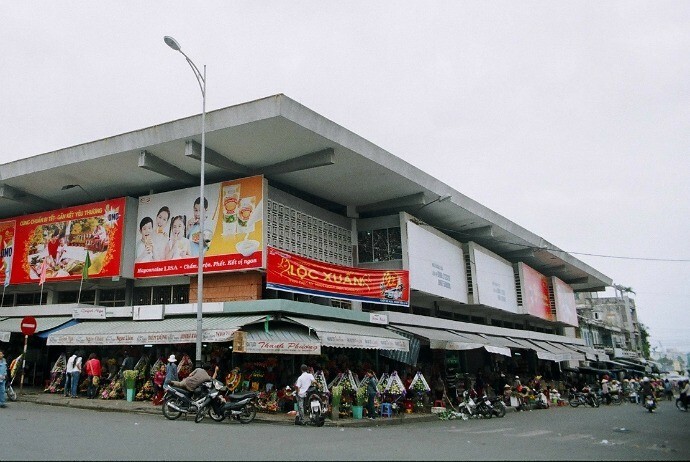 Aside from various choices of goods, Han Market attracts a large number of people by its relatively low prices as it functions as the center where goods are gathered before being distributed to many smaller markets in Da Nang. This market is ideal for people looking for Da Nang’s souvenirs before coming back home. Opt for fresh fruits and local snacks when shopping there. Some specialties that could be found in this market are Chili paste, Ly Son (Lý Sơn) garlic, dried squids, dried rice crackers. Han Market’s entrances and outskirts are a bustling market place in themselves, without florists, vegetable and fruit traders, jewelers and pharmacies, it is a good warm up for what situates ahead. On the upstairs, you will find cosmetics, home-wares, and clothing. Almost everything sold out here is aimed at Vietnamese customers, so if you are larger than the average Vietnamese, you might not find anything that could fit you. Bargaining is still the most popular way to purchase things in Da Nang. Some relish bargaining while others loathe it. As a customer, you could easily reach Han Market by a motor taxi or taxi. Known as a family-oriented shopping mall, Big C is a supermarket that focuses on supplying clients the top-notch service and quality nearly at the lowest prices. You could find various types of domestic and imported products as well as services such as household goods, wines, cosmetics, and organic products. In reality, Big C’s own private brand is significantly priced lower than other leading brands. Aimed to offer one-stop shop experience, Big C houses a lot of other businesses ranging from karaoke and cinemas booths to fashion boutiques and bookshops. Also, Big C has an in-house bakery that offers freshly baked breads as well as pastries. Actually, Big C Da Nang is referred to as a whole shopping complex not just simply the supermarket. Hence, if you plan a long vacation in Da Nang, you should consider Big C Da Nang as an all-in-one destination for shopping in Da Nang. 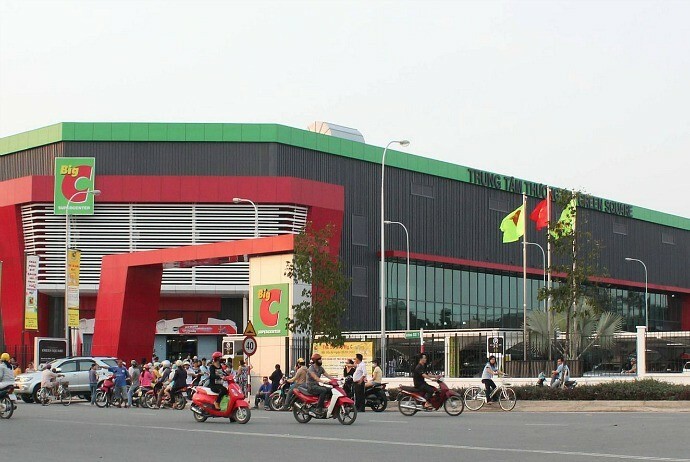 Officially known as Da Nang commercial center, Con Market is reckoned as the busiest market in Da Nang. Situated at the corner of Ong Ich Khiem (Ông Ích Khiêm) Street and Hung Vuong (Hùng Vương) Street, two major streets in Da Nang city’s center, this market is extremely convenient for both local people and tourists to shop there. 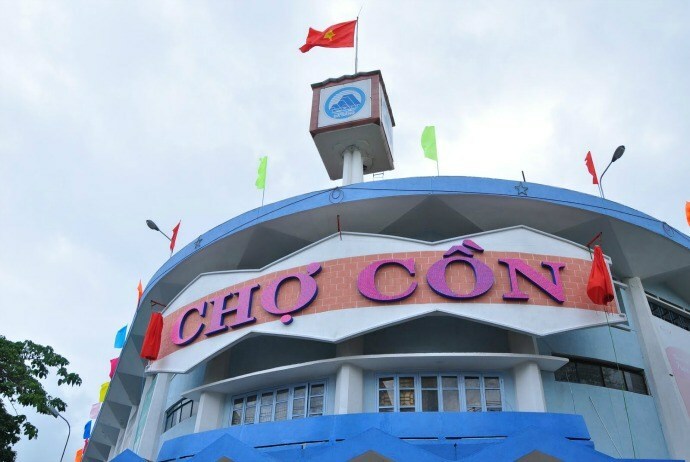 Con Market offers travelers the most authentic “local experience” of shopping in Da Nang, because it is the place where a lot of families go shopping for their groceries as well as other necessary items. With the volume of over 11,000 clients each day, Con Market is now home to up to 2,000 stalls and a variety of selections of goods could be found there. The entrance of this market is just 20 meters long, yet every centimeter is jam-packed with crowded stalls, offering all types of tasty local dishes. Aside from Han Market, Con Market is another place for tourists to purchase specialties of Da Nang and the central area of Vietnam at such reasonable prices. The current Con Market is not only a shopping venue of Da Nang city, but also a must-see place for tourists visiting this beautiful seaside city. It is better for you to visit Con Market in daytime. And, note that bargaining is required when shopping here as you could pay approximately 30-40% lower price for your desire items. 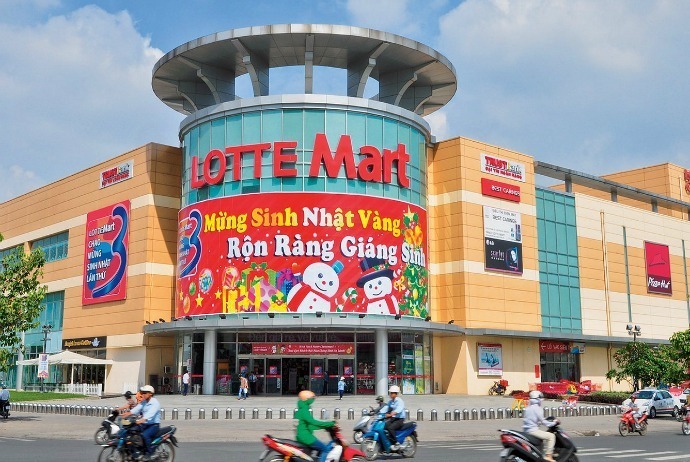 Lotte Mart Da Nang is situated in the Southeast monument, Hoa Cuong Bac (Hòa Cường Bắc) Ward, Hai Chau (Hải Châu) District, Da Nang City. With about 24,000 m2 of business area, Lotte Mart Da Nang is a business commercial center with high-end entertainment to meet the needs of shopping of the locals and tourists alike. There are 5 levels in Lotte Mart Da Nang. The first level includes fast-food restaurants like Jolibee, Lotteria… and particularly the electronic centers of many famous brands like Samsung Galaxy. The second level houses cosmetics, couture clothes, shoes with well-known brands, both domestic and international, like Levis, Magoza, Nike, Sense, Debor, The Face Shop, Sun Flower, and more. The third level is for all food products with reputable brands and top quality in Vietnam like Vissan, ACE COOK, Dutch Lady, Vinamilk, etc. Also, most Japanese, Korean, and Chinese products are sold here. Particularly, this market always makes stringent standards of food safety and hygiene to protect the health of community. The last level is for dining and serves the demands of entertainment for clients. There are many types of restaurants, spaces for entertaining (roller skating, bowling…), coffee shops or cinemas with famous brands like Lotte Cinema, Lotteria, Paris Baguette, and Coca express. If you want to find a place for shopping in Da Nang where you could easily opt for souvenirs and gifts symbolizing for Da Nang, then this is your best choice. They design their products with the images of Da Nang city in the hope that they could bring this city to the whole world. Actually, there is a variety of products to opt for, from teddy bear, T-shirt, to key rings, magnet, etc. 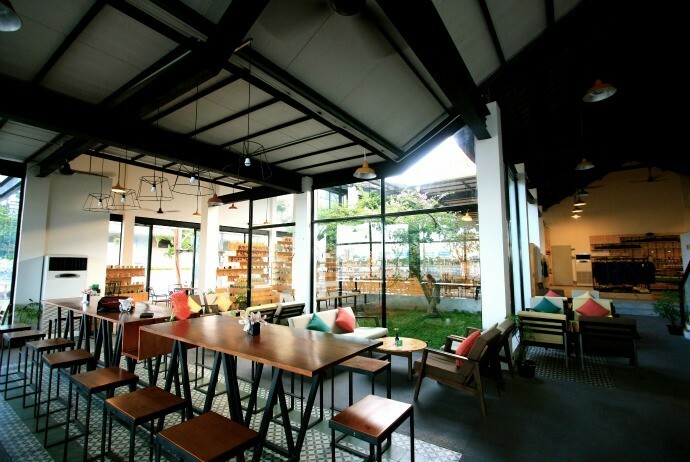 Furthermore, this shop has a café area with free WIFI which offer customers some rest with thirst-quenching beverages. Location: 34 Bach Dang (Bạch Đằng) Street, next to Da Nang Administrative Center and Novotel Da Nang Premier Han River. Apart from 5 worth-visiting places in regard to shopping in Da Nang introduced above, there are still other shopping sites you could consider. Da Nang, in fact, is an upper class city, so the economy here is well-maintained. That is why you will see a lot of shopping centers selling both modern and traditional products. Other markets include Hoang Dieu (Hoàng Diệu), Hung Vuong (Hùng Vương), Phan Chu Trinh (Phan Chu Trinh), where you could find clothes, DVDs, shoes, bags, house wares or anything you might need. Besides, ceramics and art crafts are sold popularly in vending streets, souvenir shops, and even in hotels. If possible, ask around the city to find out the best tailor shops, stone carving shops and silk shops. Hope that you have great experience when shopping in Da Nang and bring beautiful gifts to your friends and family members. Did I miss any great places for shopping in Da Nang? Share your thoughts with us by leaving your words below this article. We love to hear your voice!